In our latest Backstory series, Seattleite Lou Maxon recounts the thrills and trials of ditching the suburbs, buying property, and designing and building a modern house with Tom Kundig of Olson Kundig Architects. Week 12: Building with Kids. As part of the process in hiring the architects the entire family was able to visit a range of projects by Tom Kundig. One of our favorites was The Brain. 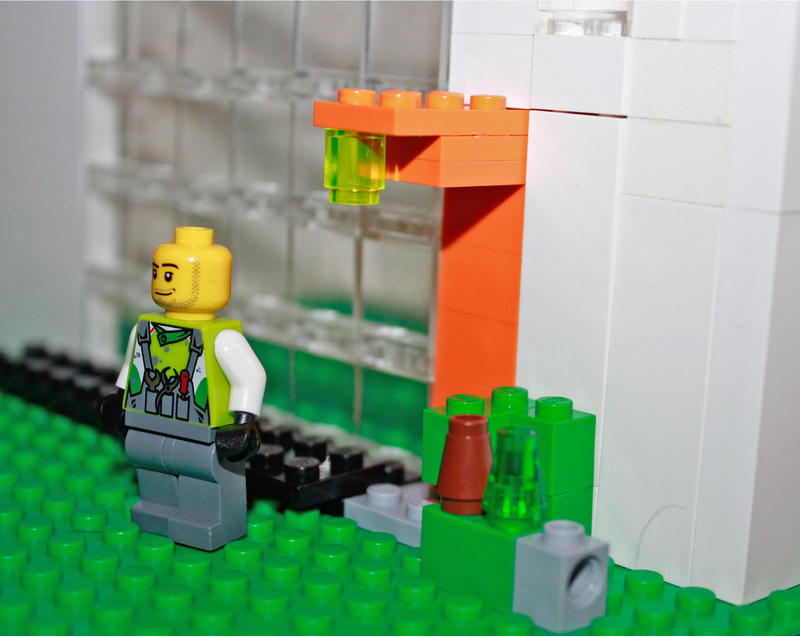 Here, a Lego model representing the entrance to the Brain Studio. No detail is overlooked from the entry canopy to the lighting. One of the best ways to get the kids involved was to let them make their own house creations and try to mimic some of Kundig's projects on their own (and with the help of their dad!). A peek inside the lightbox that is the Brain Studio (in Lego form). In the real Brain, the kids loved the Kundig-designed fire pole and the marbles that filled the concrete form work. How do you represent oxidizing raw steel with Legos? A multicolored red, orange, and yellow mix helps represent the outer skin of our future home. The kids inspired me to create a rough model of our house based on our initial schematic plans. Here, a peek at the cantilevered portion of the house with the flat membrane roof. During the initial site visit Olson Kundig Architects snapped some photos of us on the site. Here, a shot of Henry running down the existing logging road. It was obvious to us as clients that the architects understood early on that this was a house for not just my wife and me, but the entire family. Both Tom Kundig and Edward LaLonde from Olson Kundig embraced the challenge and involved the kids when appropriate in the entire process. Jack checks out the plans and paperwork in advance of our meeting at Olson Kundig Architects. He's always been passionate about engineering and design and has been a frequent participant in the entire process. Henry takes aim with his Nerf gun while visiting the property. The forested site has provided a perfect backdrop for epic Nerf wars and other makeshift battles. The kids have gotten to know the site and become comfortable in their future backyard during frequent trips over the last couple years. One of Jack's favorite activities has been visiting the site and collecting bugs and insects of all sorts. Here he checks out his options while standing at the slope's edge. Charlie, our youngest sets up his own construction site on the property and transfers some wood chips with the help of his truck. He's practically grown up on the property and the transition to his future playground has been seamless. Who doesn't love snow? Jack enjoys a trip up to the site during frigid temperatures. One our favorite Kundig projects to visit are the Rolling Huts. One of our first Lego ventures was a re-creation of the Rolling Huts. There are a total of six in "the herd" but we didn't have enough Legos to complete the entire set. Construction detail of the Brain studio from our Lego model. In lieu of cast in concrete we used pre-fabricated Lego blocks to build the studio in just a few hours. Luckily we can clean up these windows with a Q-Tip and some Windex. I remember flipping through modern design magazines before we started this project; many cool houses I'd quickly dismiss because the owners obviously did not have children. They were either sweet bachelor pads or stunningly spare dwellings for empty nesters. At the time we had three small but quickly growing children (all boys). Designing a house meant not just thinking about what would suit the kids now, but also what we'd need and want when it was time to move in, as well as further down the road. We decided early on to involve the kids in the entire journey, from our land search to final property selection to our first site meeting with Tom Kundig and Edward LaLonde. I'll be honest, it took the kids some time to adapt to the concept of moving from the comforts of suburbia to the unknown of rural America. We wanted the kids to help shape their own environments, so we commenced the conceptual and schematic schemes by focusing on their bedrooms. They were excited to know that, for the first time, they'd get their own rooms! The kids have witnessed the entire transformation of the site and all four seasons from blazing hot sun of the summer months to the low 20's of the winter. They've attended design meetings, build Lego models of their favorite Kundig projects, and inspired me to do a not-so-scale model of ours. They've sent sketches to Tom Kundig and visited the workshops of some of the craftspeople involved in the project. They've inspired the design process along the way and hopefully picked up on the passion, commitment, and love of the journey that we all share. For previous installments of "Building the Maxon House," click here.